It's always a good time to say 'I love you', especially to your kids. But at this romantic time of year it's always nice to celebrate with a little extra love. 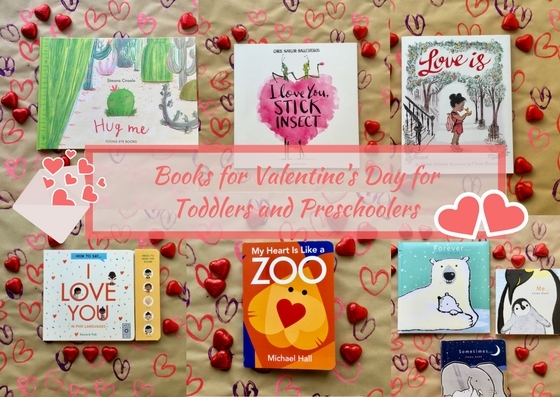 So here's a little list for you of some stories about love to share with your tots and toddlers. First of all I wanted to share a story about friendship - after all that's the sort of love that we all cherish but sometimes forget to celebrate. 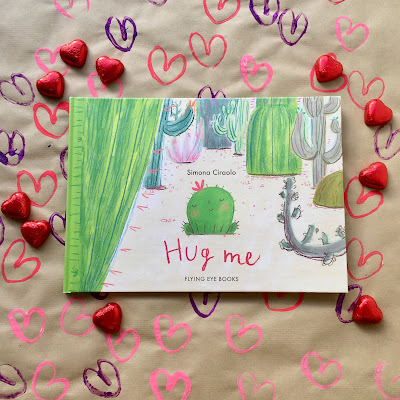 'Hug me' by Simona Ciraolo is the story of a little cactus who simply wants a hug. It's got to be pretty hard being a cactus - they have such a prickly reputation - and especially so when you're family believes that everything should be neat and tidy and that no one should ever trespass into another person's space. But little Felipe thinks his family are worrying about all the wrong things and they didn't even notice that all he wants is a hug. How do you find a hug when you're a cactus though? This story is one about finding the perfect friend, a soulmate of sorts, who will give you a hug, just when you need it. 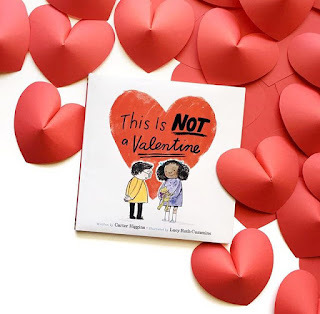 It's sweet and the illustrations are adorable and it's a lovely little read about finding your best friend! Sometimes love can get lost in translation! But not for your little ones with the help of this very clever interactive sound book. It will help you learn exactly what to say in the language(s) of love! On each page you meet a child who speaks a different language - French, Spanish, Mandarin, Japanese and English and using the sound buttons on the side you can learn how they say 'I love you'. There is also some additional text with the words for 'hello' (though I think there is to be a sequel with sound buttons for hello) and a sentence about the illustration. Each child is beautifully illustrated and on the corresponding page their is a delightful illustration depicting love - the love between a boy and his dog,, between friends, neighbours, a daughter and her mother and between brothers. I really love this one - and BookBairn has definitely been absorbing the languages as she came up and said to me "Wo ai ni" in Mandarin. This just melted my heart. 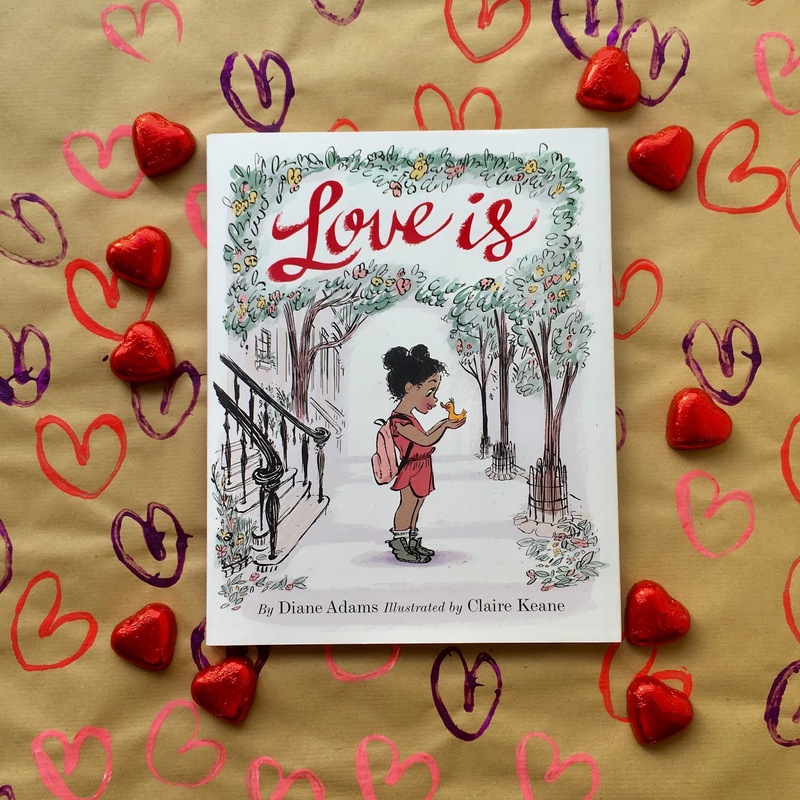 This book isn't really about love, but it is full of heart. Literally. Each animal illustration is created from love hearts. 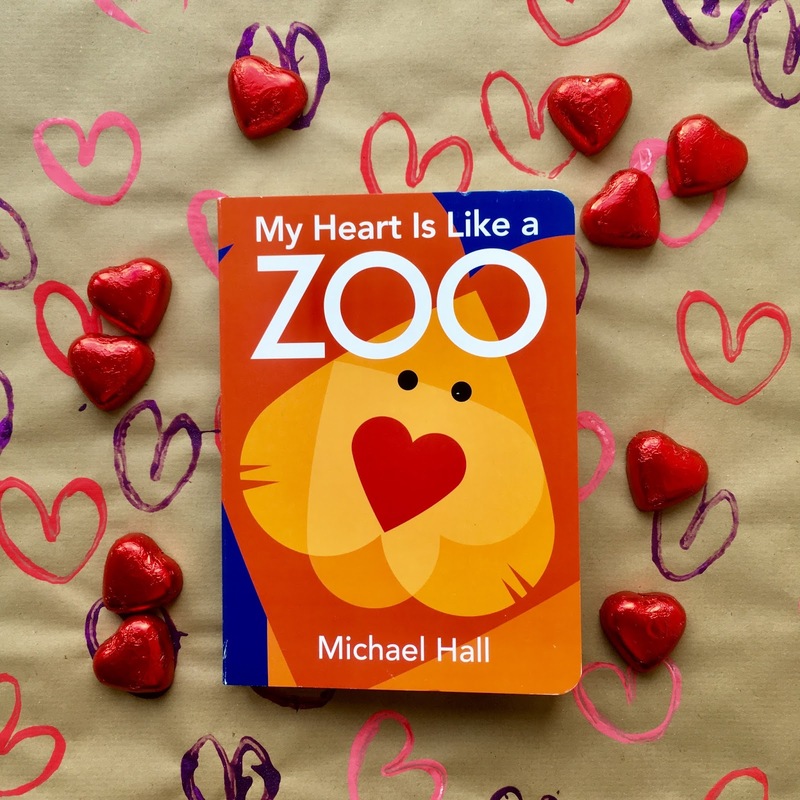 Described as a 'book about feelings, colours, shapes, counting and animals' it really is a book to be explored and played with. Mostly I like the style of artwork. 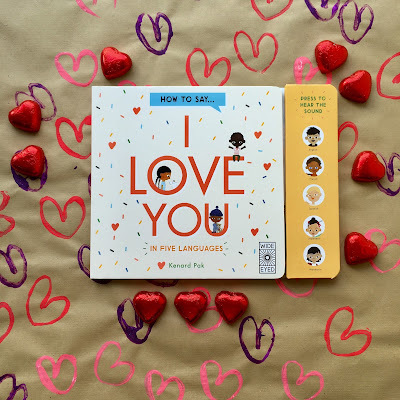 The rhymes are cute and you could count the hearts but really it's a great one for visuals for your tiny tots who really enjoy high contrast colours and images. 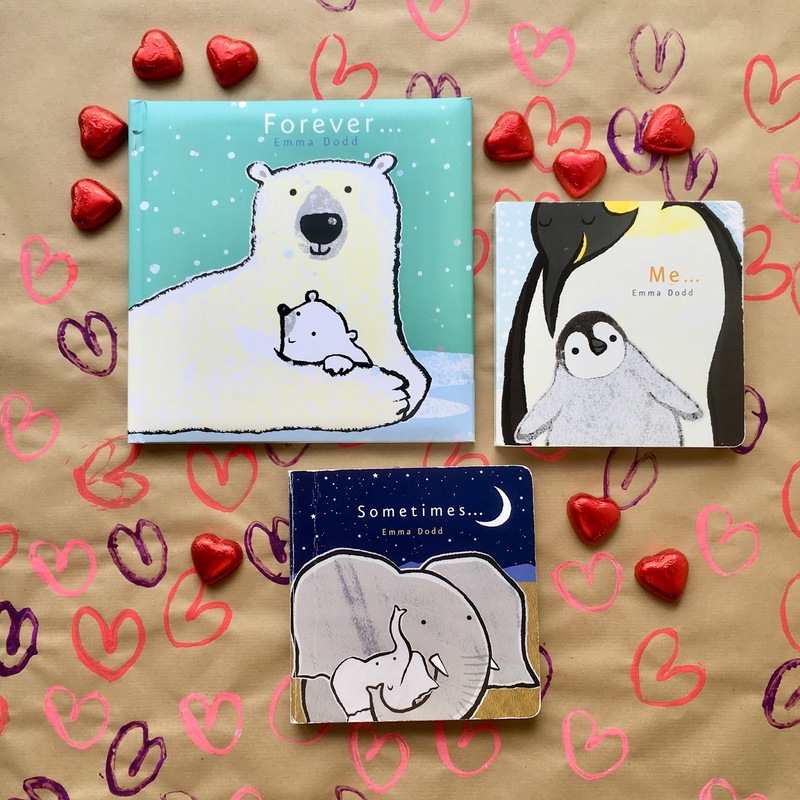 I love the toddler-friendly activity designed by @kidlitcrafts over on Instagram (linked here) where you can create your own creatures with love heart cut outs and it's one I will definitely be doing with BookBairn in the future. 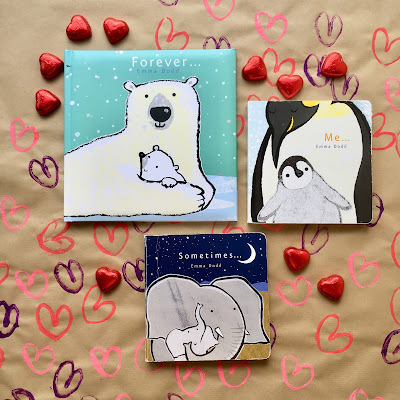 Emma Dodd writes the most wonderful books about parental love. The love between a parent and a child is such a magical thing and quite tricky to capture well but Emma's words do a superb job of capturing that everlasting, all-encompassing, forgiving love. @afriendlyaffair on Instagram recently shared a whole series of book suggestions for books about 'real love'. Not the romantic sort of whimsical something from fiction love but real realistic love. And I think Emma captures it so well in her books but in a poetic, beautiful bedtime story sort of prose. The illustrations are also beautiful and if you get the paperback or hardback (not board book) editions every other page has foil details that make the illustrations really shine! As you can see from the photograph our copies are well-loved: I think I have read 'Me" (it's our favourite) over a thousand times. If that doesn't tell you how much we love this one I don't know what I could say to convince you further. I saw the book trailer for this one recently and I knew it was one that I had to have for Valentine's Day! 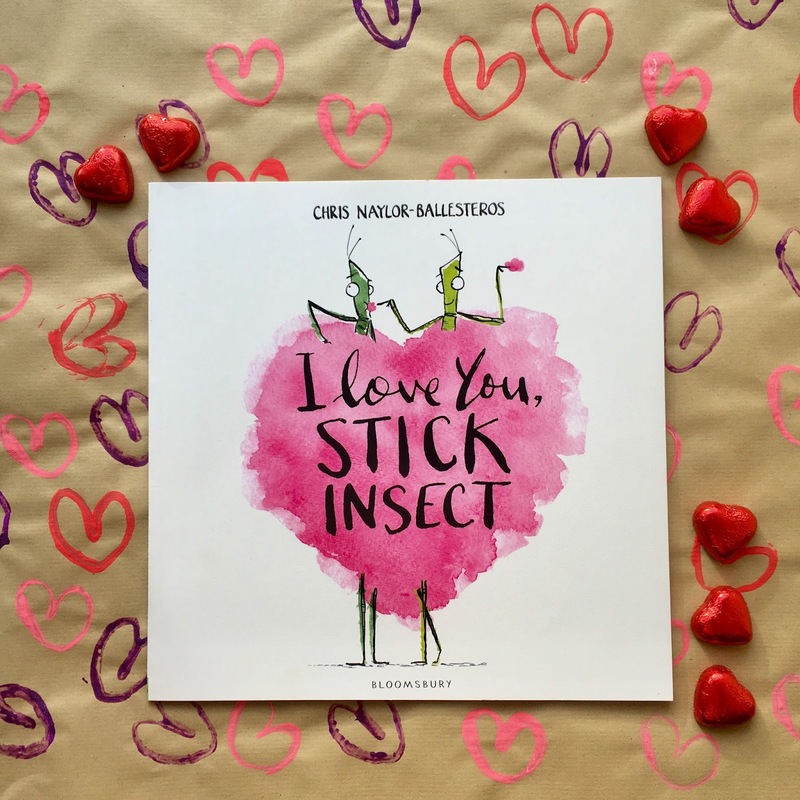 It is the delightful story of a stick insect who has fallen in love with (he thinks) another stick insect (it's actually a stick!). And he* dreams of all the lovely things that they will do together. He imagines them surfing, skating, paragliding, hula-hooping, eating ice cream, candyfloss and popcorn. He's good at planning dates this stick (Daddy BookBairn take note!). The illustrations are whimsical, sweet and hilarious! I don't want to spoil the ending but this is a love story that doesn't quite have a happily ever after. But that's ok. Sometimes love can be like that. *I say he but I have no way of determining one stick insect from another so it might be she. Accordingly the relationship could be two males, two females, or heterosexual. Who knows? Who cares? This is the one that got away (I guess that love can be like that too, can't it). I held off buying it and then I got bad book-regret but none of my local bookshops stock it (thought all would order it for me) because it's a new release and only out in hardback. But I wish I had a copy. Here's what I know. It's the story of a little boy who is not sending his love a Valentine. At least it's not just a Valentine because he really does love her, not just on Valentine's day but every day! And the illustrations look adorable, the children are charming and I can see why everyone is raving about it! Also, you know I love an endpaper and this one has a hardcover under the slipcover that is super sweet which just thrills my book nerdy-ness! I have ordered a copy. But it didn't come in time for this post. Thanks to Summer from @readingisourthing for letting me pinch your photo. We so love these books. Do you have any plans for Valentine's Day? We have a Nature Tots walk and then I have some crafty bits to do in the afternoon. So romantic! And also remember the 14th February is Book Giving Day and will be the start of nine days of giveaways on our social media! Please feel free to pin this image on Pinterest for future reference. *Some of these books were sent to us by publishers for review and others are ones that we have purchased ourselves. All opinions are our own. I love this collection. It’s funny but for Valentine’s Day I also have a Nature Tots walk planned and then a playdate with my lovely loved ones.